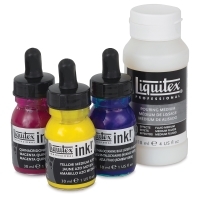 Use for watercolor effects, color blocking, and under-painting. 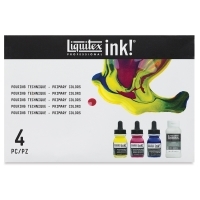 Since they don’t require dilution, they’re also ideal for airbrushing, calligraphy, and stamping. Used alone or mixed with other Liquitex Professional Acrylic inks and mediums, these bold, intense acrylic inks offer unlimited artistic possibilities. Pouring Technique Set — Expand your range of techniques! 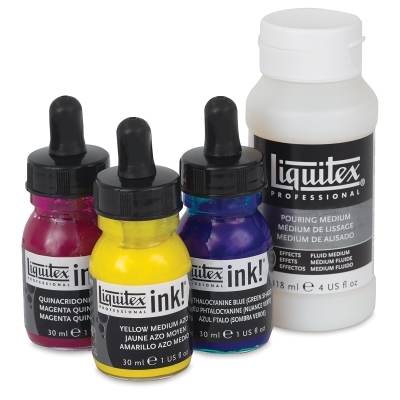 This set includes three 30 ml bottles of Liquitex Ink in Phthalocyanine Blue (Green shade), Quinacridone Magenta, and Yellow Medium Azo), plus a 118 ml bottle of Liquitex Pouring Medium. 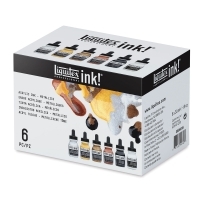 Metallic Colors, Set of 6 — This set contains six, 30 ml (1 oz) bottles, including Iridescent Bright Gold, Iridescent Rich Bronze, Iridescent Rich Copper, Iridescent Bright Silver, Carbon Black, and Titanium White. 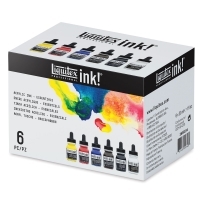 Essential Colors, Set of 6 — This set contains six, 30 ml (1 oz) bottles, including Naphthol Crimson, Yellow Medium Azo, Phthalocyanine Blue Green Shade, Carbon Black, Titanium White, and Transparent Raw Umber. 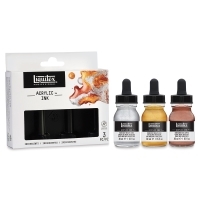 Iridescent Colors, Set of 3 — This set contains three 30 ml (1 oz) bottles, including Bright Gold, Iridescent Bright Silver, and Iridescent Rich Copper. 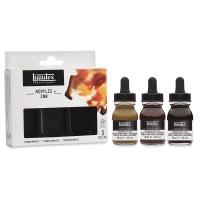 Transparent Colors, Set of 3 — This set contains three 30 ml (1 oz) bottles, including Burnt Sienna, Transparent Burnt Umber, and Transparent Raw Sienna. 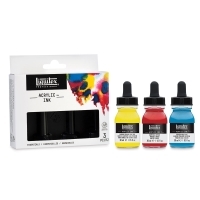 Basic Colors, Set of 3 — This set contains three, 30 ml (1 oz) bottles, including Cadmium Yellow Light Hue, Naphthol Crimson, and Cerulean Blue Hue.